In this chapter of iOS 7 App Development Essentials, many of the Sprite Kit framework features outlined in the previous chapter will be used to create a game based application. In particular, this tutorial will demonstrate practical use of scenes, textures, sprites, labels and actions. In addition, the application created in this chapter will also make use of physics bodies to demonstrate the use of collisions and simulated gravity. The game created in this chapter consists of a single animated character that fires arrows across the scene when the screen is tapped. For the duration of the game, balls fall from the top of the screen with the objective being to hit as many balls as possible with the arrows. When an arrow hits a ball, the texture of the arrow is changed to make it appear as though the tip of the arrow is embedded in the ball. A physical join is also established at the point of collision so that the arrow sprite remains stuck into the side of the ball as it continues to fall off the bottom of the screen. WelcomeScene – The scene which appears when the game is first launched. The scene will announce the name of the game and invite the user to touch the screen to begin the game. The game will then transition to the second scene. ArcheryScene – The scene where the game play takes place. 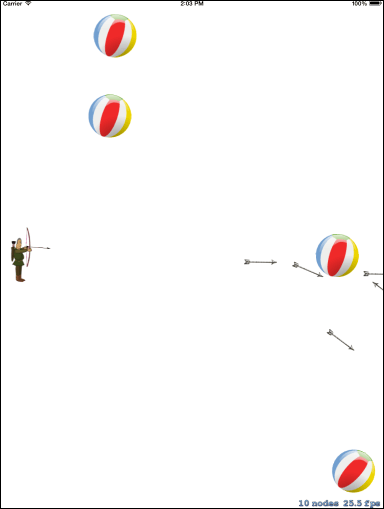 Within this scene the archer and ball sprites are animated and the physics behavior and collision detection implemented to make the game work. Welcome Node – An SKLabelNode instance that displays a message to the user on the Welcome Scene. Archer Node – An SKSpriteNode instance to represent the archer game character. The animation frames that cause the archer to load and fire an arrow are provided via a sequence of image files contained within a texture atlas. Arrow Node – An SKSpriteNode instance used to represent the arrows as they are shot by the archer character. This node is initially assigned a texture showing the entire arrow. This texture is then changed on collision with a ball to show the arrow embedded into the target. This node has associated with it a physics body so that collisions can be detected and to make sure it responds to gravity. Ball Node – An SKSpriteNode used to represent the balls that fall from the sky. The ball has associated with it a physics body for gravity and collision detection purposes. Game Over Node – An SKLabelNode instance that displays the score to the user at the end of the game. To create the project, launch Xcode and select the Create a new Xcode project option from the welcome screen (or use the File -> New -> Project…) menu option. On the template selection panel (Figure 57-2) make sure that the Application category is selected under iOS in the left hand pane before choosing the SpriteKit Game template option. 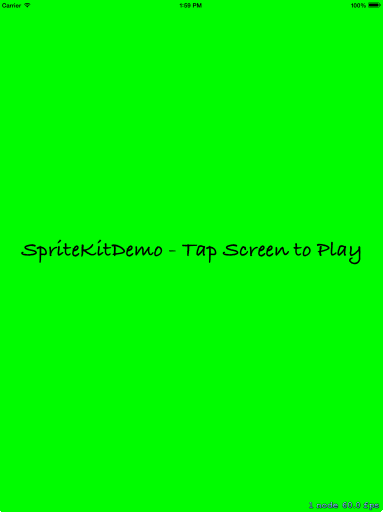 Click Next to proceed, enter SpriteKitDemo as both the product name and class prefix on the resulting screen and change the Devices menu to iPad. Click Next and choose a suitable location for the project files. Once selected, click Create to create the project. 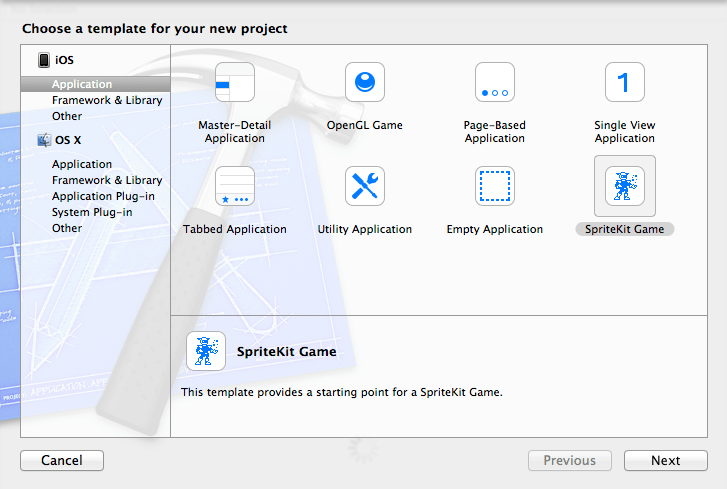 Selection of the SpriteKit Game template has caused Xcode to create a template project with a demonstration incorporating some pre-built Sprite Kit behavior. This consists of an SKView instance and a single SKScene child with a blue background and an SKLabelNode displaying text that reads “Hello, World!”. The SKScene instance also includes a touchesBegan method implementation which, when triggered, creates an SKSpriteNode instance textured with the Spaceship.png image file and displays it at the location at which the screen was touched. 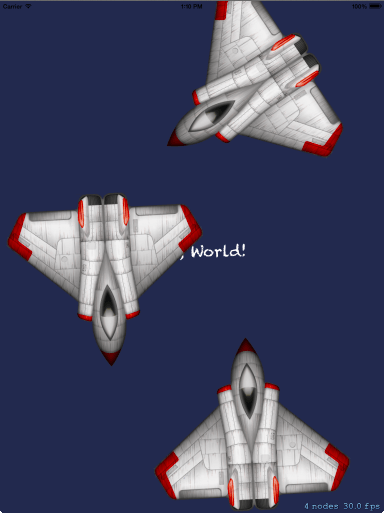 A rotation SKAction is then created and run on the space ship sprite node so that the sprite spins in place. To see the template project in action (Figure 57-3), run it on a physical iPad device or the iOS simulator. With these changes made, it is time to start creating the SpriteKitDemo game. Note that the showsFPS and showsNodeCount properties are left enabled in the above changes. This will cause diagnostic information about the frames per second rate and number of active nodes to be displayed on any child scenes. This is useful for tracking the performance of a game during the development process and should be removed once development is complete. As previously outlined, the first scene of the game is a welcome screen on which the user will tap to begin playing. Add a new class to the project to represent this scene by selecting the File -> New -> File… menu option. In the file template panel, make sure that the Cocoa Touch entry listed under iOS is selected in the left hand panel and then choose the Objective-C class template before clicking on Next. On the subsequent screen, name the class WelcomeScene and make it a subclass of SKScene before clicking on Next. On the final screen, navigate to the project directory where you would like the files to be created before clicking on Create to add the new class to the project. Repeat the above steps to add the second scene to the project. This scene should be named ArcheryScene and should also be subclassed from the SKScene class. Compile and run the application and note that a black scene appears and that diagnostic information reports that there are zero nodes currently active in the scene. It is now time to add some behavior to the WelcomeScene class. These steps involve changing the background color of the scene and then creating and displaying an SKLabelNode instance that displays a message to the user. This method performs some very simple tasks. First it changes the background color of the scene to green (note the use of the SKColor class when working with colors in Sprite Kit as opposed to the UIKit UIColor class). The method then scales the scene so that it fills the entire view. A method named createWelcomeNode (which has not yet been implemented) is then called and the resulting node added to the scene. The sceneCreated variable is then set to indicate that the scene has been created. Note that the diagnostic display now indicates the presence of a single node (the SKLabelNode instance). Clearly having instructed the user to tap the screen in order to play the game, some code now needs to be written to make this happen. This behavior will be added by implementing the touchesBegan method in the WelcomeScene class. Rather than move directly to ArcheryScene, however, some effects will be added in the form of an action and a transition. Before moving on to the next steps, we will take some time to provide more detail on the above code. Compile and run the application. Once running, touch the screen and note that the label node fades away and the transition to the ArcheryScene takes effect. Once again, we are presented with a black scene that now needs to be implemented. Within this method, the background color of the scene is set to white and the scene is scaled to fill the parent SKView area. Next, a method named createArcherNode is called. Once implemented, this method will create a new SKSpriteNode instance and assign a texture to it so that it appears as an archer with a bow and arrows ready to be launched at the targets. The method then sets the position of the archer sprite so that it appears near the left hand edge of the scene before adding it as a child to the SKScene parent. Within the code sample archive, locate the folder named SpriteImages. 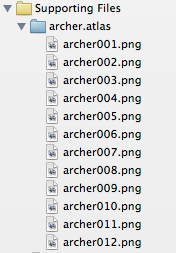 Located within this folder is the archer.atlas sub-folder which contains the animation images for the archer sprite node. By default, the project should be configured to generate the texture atlas when the application is compiled. Verify that this is the case by selecting the project name at the top of the project navigator panel followed by Build Settings in the main panel. Enter spritekit deployment into the search field and make sure that the Enable Texture Atlas Generation option is set to YES (Figure 57 6) for the SpriteKitDemo target. When the archer sprite is first initialized it needs to be textured with the archer001.png file from the texture atlas. This takes place in the createArcherNode method which now needs to be implemented. This method will create a new SKSpriteNode object and reference the archer001.png texture file located in the texture atlas. When the user touches the screen, the archer sprite node will launch an arrow across the scene. 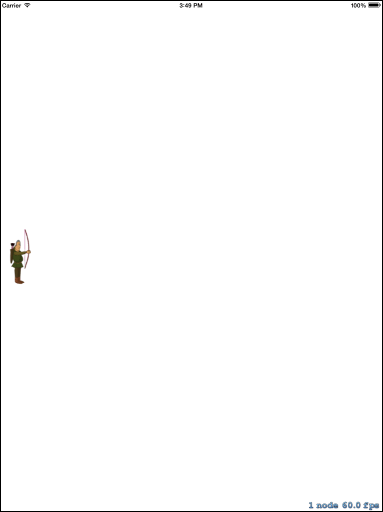 For the purposes of this example we want the loading and shooting of the arrow by the sprite character to be animated. The texture atlas already contains the animation frames needed to implement this (named sequentially from archer001.png through to archer012.png), so the next step is to write some code to implement the animation. In the first instance, an array of the textures in the animation atlas needs to be created. Whilst it is possible to write code to manually reference each texture file, this would quickly become a cumbersome task for animations involving large numbers of textures. A more efficient approach is to write a for loop to iterate through the files in the atlas, assigning each file name to the texture array. Since this only needs to be performed once each time the scene is presented, this is best achieved within the initArcheryScene method. The above code creates a temporary array named archerFrames before obtaining a reference to the archer texture atlas. A loop is then initialized based on the number of textures in the atlas. With knowledge of the naming convention of the image files, a texture file name is created and the textureNamed method of the SKTextureAtlas instance used to extract the texture with the corresponding name. The texture is then added to the archerFrames array. Once the array has been populated with the image names it is assigned to the archerAnimation array where it will be referenced later to animate the sprite node. The method obtains a reference to the sprite node representing the archer character in the game, creates an SKAction object configured to animate the texture frames in the archerAnimation array and then runs the action on the archer node. Run the application and touch the screen within the Archery Scene. Each time a touch is detected, the archer will run through the animation sequence of shooting an arrow. At this point in the tutorial, the archer sprite node goes through an animation sequence of loading and firing an arrow but no actual arrow is being launched across the scene. In order to implement this, a new sprite node needs to be added to the ArcheryScene. This node will be textured with an image of an arrow and will be placed to the right of the archer sprite at the end of the animation sequence. A physics body will be associated with the arrow and an impulse force applied to it to propel it across the scene as though shot by the archer’s bow. The code creates a new SKSpriteNode object, positions it to the right of the archer sprite node and assigns it the name arrowNode. A physics body is then assigned to the node, using the size of the node itself as the boundary of the body and enabling precision collision detection. Finally the node is returned. A new SKAction object is created, this time specifying a block of code to be executed. This run block calls the createArrowNode method, adds the new node to the scene and then applies an impulse force of 35.0 on the X axis of the scene. An SKAction sequence is then created comprising the previously created animation action and the new run block action. This sequence is then run on the archer node. When executed with these changes, touching the screen should now cause an arrow to be launched after the archer animation completes. Note that as the arrow flies across the scene it gradually falls towards the bottom of the display. This is, of course, due to the effect of gravity imposed upon the physics body assigned to the node. The objective of the game is to score points by hitting balls with arrows. Clearly, the next logical step is to add the ball sprite node to the scene. Begin by locating the BallTexture.png file in the SpriteImages folder of the sample code package and drag and drop it onto the Supporting Files section of the project navigator panel. This code creates a sprite node using the ball texture and then sets the initial position at the top of the scene but a random position on the X axis. The node is assigned a name and a physics body that is slightly less than the radius of the ball image (this will ensure that there is no gap when the arrow is made to stick into the ball in the next chapter). Precision collision detection is enabled and the ball node is added to the scene. The goal for the completed game is to have the arrows stick into the balls on collision and for a score to be updated for each hit. The steps to implement this behavior will be covered in the next chapter entitled An iOS 7 Sprite Kit Collision Handling Tutorial. The goal of this chapter has been to create a simple game for iOS 7 using the Sprite Kit framework. In the course of creating this game topics such as using sprite nodes, actions, textures, sprite animations and physical forces have been put to practical use. In the next chapter, this game example will be further extended to demonstrate the detection of collisions and the use of physical joins. This page was last modified on 27 October 2016, at 19:59.